You've been keeping the home fires burning for a few months now. But have you been properly caring for and feeding your hearth to ensure your family's safety? Every type of fireplace, whether wood-burning, gas, or electric, poses a potential danger to everyone in your home if used incorrectly. 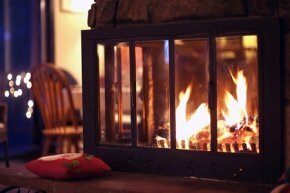 These 14 fireplace safety tips can help ensure winter nights by the fire are cozy and safe in your home. To minimize the buildup of soot and creosote (which can cause chimney fires), use seasoned hard wood or manufactured logs, such as Duraflame, that burn even cleaner than real wood. If you do use manufactured logs, be sure to follow the directions on the bag. These logs burn hotter than regular wood and can potentially warp metal chimneys if you burn more than one at a time. Follow use directions on the bag. Only burn wood or manufactured logs in your fireplace. Items with fancy finishes - like glossy wrapping paper, shiny bows, and foam peanuts - release toxic fumes. You'll also want to avoid burning resinous woods such as pine (which leave creosote in the flue), as well as evergreen boughs and large quantities of paper, which can flare up and quickly get out of control. Though a roaring fire looks attractive, it's not as safe as a slower, steadier burn. Too-hot a fire can crack your chimney. Just a couple of logs at a time, please. Stack logs near the back of the fireplace to prevent fire and ashes from finding a way out of the hearth and into your home. Open the damper before starting a fire in the fireplace. Keep the damper open until the fire is completely extinguished. Don't position your Christmas tree - or anything else - near the fireplace. Should embers spark out of the fireplace and into the room, you want to make sure there is nothing nearby that will catch fire. This is an essential fireplace safety rule. For safety's sake, never leave a fire unattended. And yes, this means you shouldn't go to sleep with a fire blazing away. Fires require about five times as much oxygen as a room usually needs. To make sure there's enough oxygen for the fire to burn efficiently, open a window when you light a fire. While you'll want to leave chimney cleaning to the pros, undertake minor maintenance yourself: If you burn wood, clean the firebox between fires. Scoop up cool ashes and place them in a metal container. Close the flue or air intake after each use to keep indoor heat from escaping up the chimney. A cozy fire can cause a structural blaze if creosote is allowed to build up in the flue and ignite. Have your chimney professionally inspected and cleaned once a year. A safety must have is a carbon-monoxide detector. This deadly, colorless, odorless gas misbecoming a threat in more and more of today's energy-efficient and airtight homes. The source of carbon monoxide is usually faulty burning in, or poor venting of, a fireplace or other appliance. Stash a fire extinguisher near the fireplace so that it's handy - just in case. The best extinguisher is an easy-to-handle 2- or 5-pound (1 or 2.5 kg) model designed to put out most household fires, like this one from First Alert. Congratulations! You've now got fireplace safety covered in your home.